Read how Mass General is leading the way in educating care providers, improving the health of local and distant communities and establishing best practices and health policy. Start an online campaign for a cause you care about, get a crowd of your friends and family together and show your support, or pursue an individual event, like a race or ride. Whatever you do, you can do it and raise vital support for any area at Mass General. Have an immediate, lifesaving impact simply by giving to the MGH Fund. Become a sustaining supporter of the the MGH Fund. Learn more. Dr. Brad Dickerson explains the collaborative approach to research at MIND Visiting Day. Researchers from the MassGeneral Institute for Neurodegenerative Diseases (MIND) detailed some of the latest advances in brain disease research at MIND's 2018 Visiting Day. Determined collaboration and groundbreaking technology have led to exciting advances in efforts to solve the challenges of brain diseases, researchers from the MassGeneral Institute for Neurodegenerative Diseases (MIND) told patients, families and friends recently. On May 16, 2018, nearly 100 people attended the event at the MIND labs at the Charlestown Navy Yard. 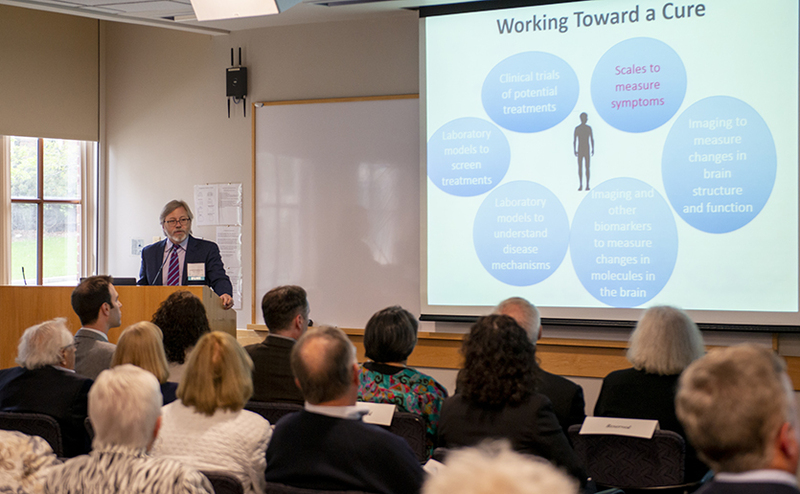 MIND’s Visiting Day gathering included a reception and presentations by researchers working in amyotrophic lateral sclerosis (ALS), frontotemporal disorders, Parkinson’s disease and dystonia. MIND founder Anne Young, MD, PhD, and Merit Cudkowicz, MD, MSc, chair of Neurology, highlighted the interdisciplinary collaborative environment at MIND. Both emphasized the great impact philanthropy plays in supporting promising ideas at their earliest stages, encouraging scientists in different specialty areas to share ideas, equipment and insights to accelerate their research. New imaging and genomics allow researchers to pinpoint with extraordinary accuracy the pathways behind many neurological disorders. These innovative technologies provide clinicians with a better understanding of a disease, and encourage the basic science investigators to identify therapies that can target a specific area of the brain. Brad Dickerson, MD, who specializes in frontotemporal disorders, provided an overview of the research efforts to find cures for neurological diseases, a process that starts and ends with patients. Clinicians document symptoms, perform tests and neurological exams, measure structural, functional and molecular changes in the brain through imaging and fluid samples (such as spinal fluid), develop laboratory models to understand disease mechanisms and screen treatments. This research helps identify potential therapies that are brought to our patients for testing in clinical trials. This work is often done independently in separate clinics and laboratories by neurologists studying diseases traditionally classified as distinct, such as frontotemporal dementia and amyotrophic lateral sclerosis, or primary progressive aphasia and Alzheimer’s disease. But advances in each field can help accelerate progress in other fields when common symptoms or biological mechanisms are identified that link these seemingly distinct illnesses to each other. MIND Visiting Day presenters included, from left, Drs. Brad Dickerson, Todd Herrington, Anne Young, Merit Cudkowicz, Cristopher Bragg, Nutan Sharma and Mark Albers. MIND’s interdisciplinary collaboration, however, has created opportunities for “basket” trials that allow for the evaluation of a therapy on several diseases within the same clinical trial. Dr. Albers is currently exploring the effectiveness of an FDA-approved drug called ruxolitinib, which reduces anti-inflammatory signals and is used to treat blood disorders associated with aging. Dr. Albers is hopeful this drug can reduce inflammation in three neurodegenerative diseases, and will test the effectiveness of the drug to reduce inflammatory biomarkers and clinical outcomes on three different diseases at the same time. While the initial “basket” trials focus on inflammation, other researchers are looking at movement disorders, which affect patients with Parkinson’s, ALS and dystonia. Todd M. Herrington, MD, PhD, approaches the brain as an electrical system in his efforts to reduce the toll of movement disorders, while Nutan Sharma, MD, PhD, and Cristopher Bragg, PhD, are looking closely at one specific form of dystonia to shed light on other movement disorders. Dr. Sharma and Dr. Bragg, talked about their research breakthrough in X-Linked Dystonia Parkinsonism, a rare disease that has provided insights into other movement disorders. “By finding the gene that causes this form of dystonia we are learning a great deal about the disease mechanisms, which will provide great information as we test potential therapies for this disease and other movement disorders,” Dr. Bragg said. To learn more about how you can support research at MIND, please contact us. The MassGeneral Institute for Neurodegenerative Disease (MIND) is committed to finding treatments and cures to improve the lives of patients with neurodegenerative disorders including Alzheimer’s, amyotrophic lateral sclerosis (ALS), Huntington’s and Parkinson’s disease. Founded in 2001, MIND unites scientists and physician-scientists across disciplines with the common goal of translating laboratory findings into therapies that can reach patients in the clinic. Researchers in MIND laboratories work collaboratively to achieve the most promising results. To learn more about MIND, please visit our website. Help us work toward treatments and cures for devastating neurodegenerative diseases. © 2019 Massachusetts General Hospital. Massachusetts General Hospital is a non-profit 501(c)(3) organization, and donations are tax deductible to the full extent allowed by law.